Here we are - another Thankful Thursday! This has quickly become a favorite day of the week - it is so fun to look for thankfulness. Sometimes it is very obvious what to be thankful for and sometimes you have to dig a little. It's in the digging that true gratitude forms. It is a very spiritual healthy exercise. This week I am thankful for the bounty of harvest. I used to try to grow a vegetable garden. Even though I started out in the spring with the best of intentions, by the end of the summer my poor garden never seemed very healthy. In fact it often seemed downright neglected. My life always got so busy and the garden was last on my list. But one of the privileges of ministry is that our good people share their bountiful harvest with us every year. In fact they share so much that I soon discovered it wasn't necessary for me to grow a garden. Every year we get to share the the harvest of others! What a blessing it has been to our family. I thought it would be fun to share some pictures of all the beautiful produce we have received lately. A wonderful Hispanic family in our church shared their jalapeno peppers with us. They were amazingly hot! They were so beautiful and shiny - they really looked artificial. 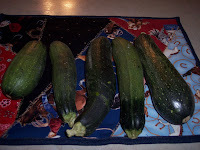 We have had lots of zucchini too. So far we have enjoyed stuffed zucchini and zucchini bread. 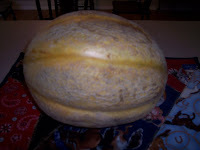 Check out the size of this cantaloupe! It was humongous! I think this is my very favorite gift from the garden. 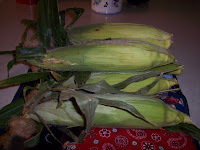 I love fresh corn! Usually we freeze some every year but this year we just couldn't fit it into our schedule. We still have some left in the freezer however from last year. 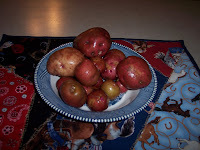 And does it get any better than new red potatoes, boiled and mashed with a little real butter? I don't think so! Check in tomorrow. I am going to post a recipe for homemade salsa/guacamole that I used my jalapenos for. It is very simple and very delicious! If you would like to be a part of this wonderful Thankful Thursday click here! I love a harvest. It just gives me a thrill in my bones. I guess because my dad's parents were Iowa farmers. Someday I want to have a garden so I can grow heirloom tomatoes and asparagus, both of which I would eat every single meal if possible! Those peppers were especially impressive! Such a great list Robin. You are so right, digging for the things to be thankful for is what produces joy. I love the garden produce. We don't grow a garden here. Not many to. Very rare. Too hot, too dry, too long of a season. I have always thought I'd try it in the fall. Your list made me hungry, lol blessings to you sweetie. 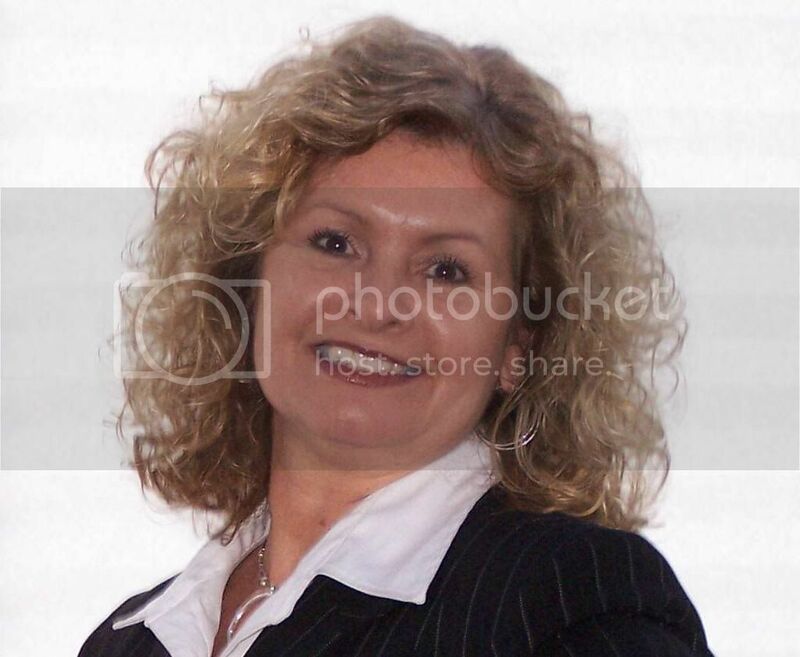 Robin---what a great blessing! Gorgeous veggies!!! I used to love to spend time in the garden...but no time-no space these days! Great blessings and your veggies are incredible! Can't wait for that recipe tomorrow. We love guacamole. Nothing better than fresh veggies. Thank heavens for your wonderful church members. Isn't it great to have friends who share with you? I have a black thumb when it comes to gardening but I love the freshness of vegetables from a garden. It is a huge blessing and gift when our friends share with us their crop. This is such a cool post. I think it is neat your have friends who bring you stuff from their garden. This is a wonderful Thankful Thursday! I love what you said about how when we have to look deeper for things to be grateful for, that is when we grow. You said it so nicely. That is so awesome! What an incredible blessing. 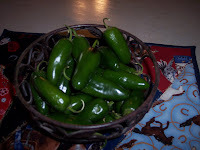 Those jalepenos would make some great salsa and they are just so shiny and beautiful! Thanks for stopping by. Great looking stuff! I love to eat what comes from the garden but am so not good at it.